The Easy Comforts catalog provides affordable health and personal care living solutions for maturing adults featuring health care solutions, mobility aids and more comforting products that make life easier. Enter promotion code - 30509000112 - at checkout on the Easy Comforts website. 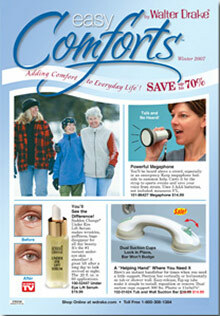 Easy Comforts catalog - Whether you are seeking easy comfort products for yourself, a family member, loved one or friend, the Easy Comforts catalog features dozens of products that are expertly designed to ease you through difficult times and situations while providing comfortable day to day solutions. Daily living solutions - Find everything from personal care items to living solutions for the home that will make cooking, cleaning, bathing and dressing less of a chore. From mobility solutions including walkers, canes, cushions and rollators to personal care items for your hair, skin, nails and feet, you'll benefit from an assortment of solutions to count and depend on for daily relief. Health care solutions - Whether you have minor aches and pains, are recovering from surgery or if you're just not feeling like your old self, Easy Comforts offers health solutions that will get you back to feeling like you again. Shop for health care solutions including braces and supports, exercise equipment, dietary supplements, eye, ear and throat relief and more wellness solutions for your mind, body and spirit. Comfort clothing and footwear Dress comfortably with easy to slip on house dresses, cover ups, robes and sleepwear, undergarments, tops, pants and other comfort clothing styles. Invest in stylish and flexible comfort footwear as well, with loafers, lace-ups, pumps and cushioned sandals that give your feet a well-deserved rest. You'll find easy comfort footwear styles as well as comfort slippers, diabetic and compression socks, support hosiery and other health care solutions for those tired old feet. Vision solutions - From eyeglass accessories and cleaning wipes to magnifiers that will bring joy back to reading the morning paper, Easy Comforts features vision solutions that will help you see more clearly. Find living solutions that will improve vision challenges with electronic reading aids, glow in the dark clocks and more vision improving products. When life presents you with a physical challenge, Easy Comforts is there to bring you comfort while helping you through the difficult times so you can fully embrace the better times. Find living solutions that will improve your day to day activities, from health care solutions to comfort clothing, footwear, diet and exercise products, the living is easy when you invest in products featured in the Easy Comforts catalog.